Swampum Blog | Give Stuff. Get Stuff. Feel Good. Email login: You can now log into your account using username OR email address–both will now work with the same password. Notification frequency setting for each relationship: In addition to a default notification frequency (set in the account modify page under the message tab), you can now control notification frequency for each relationship. 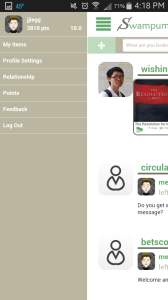 From the Relationships link in the sidebar menu, select either the Memberships or Friendships tab. Each relationship in the list includes dropdown fields for notification frequency–immediately, daily, weekly–for both messages or items posted in that group or by that user. These settings will have priority over your default notification frequency. First, searches for items and groups from the top search bar have been improved with the Sphinx search engine and will produce much better results. Also, an item search bar has been added to the top of the My Items page, so you can search within your own inventory. Finally, an item search bar has also been added to the top of the item listing for each group and user, making it possible to search within a group’s or user’s available items. Watch list links for favorite groups: To make it easier for you to find the requested and offered items posted by users in your favorite groups, we’ve created links on the home page just below the sidebar menu. For each of the top two groups in your relationship schedule (found by clicking the Relationships link in the sidebar menu), there is both a Requests and Offers link under the Watch List in the left sidebar. Clicking on one of these links will take you directly to a page for that group showing the requested or offered items currently available in that group. We hope you find these improvements useful. Keep the feedback coming–we’re all ears! This entry was posted in Uncategorized on January 19, 2015 by swampumadmin. Fortunately, this was much easier than I expected! Over the years, our accumulation of Christmas decorations has grown out of control. So this year, as part of our larger declutter project (but also because it’s a good test for using Swampum™ to pass things along to other people), we made a commitment to sort through every single piece of holiday ephemera and choose whether to keep it or not. Bottom line: we pared down from 12 storage bins to 8 and found a good amount of things to pass along for others to enjoy. First we pulled from the attic the 12 bins of decorations we sift through every year deciding what to use. This included 2 bins that are labeled “Early Christmas” because they contain the things we put up first as well as the supplies for sending out Christmas cards. Going through each bin and each item, we fairly quickly settled on 4 distinct piles: one for things we use each year and want to keep and three for things we no longer want (those our daughter may use when she has her own place, others that might have enough value to sell and finally, those that don’t have enough value to try selling and should just be given away). Those things that we think our daughter might want eventually were boxed up again and put in longer-term storage in the attic–sufficiently out of the way that they don’t clog up the annual decorating effort, but easy enough to retrieve when it’s time to pass them along. 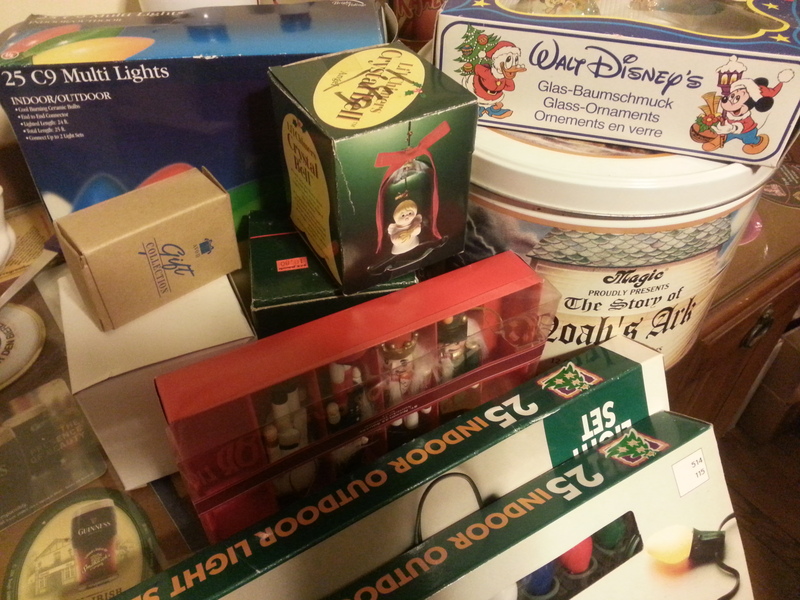 The pile of things that we thought might have enough value to sell included mostly older Hallmark and Disney ornaments. Some collectors go gaga over these ornaments, so I thought I should at least check out eBay to see what they might be worth. To my surprise, even the most valuable (based on actual completed transactions over the past few months, not just current listings) of these ornaments wasn’t worth more than $15. The prospect of earning a few hundred dollars by going through the hassle of listing, selling and shipping 30-40 ornaments didn’t appeal to me at all, so everything went directly into the “Give Away” pile. All told we ended up with about 80 different Christmas decorating items nice enough for someone else to use, and it took about a week to list them all on Swampum™ (if you’re curious, here’s what’s left). Even better, we’ve now streamlined our decorating bins down to 8 from 12 and we won’t have to go through the use/don’t use sort each holiday season. This entry was posted in Declutter on December 22, 2014 by swampumadmin. One of our primary motivations for building this site was to create a more effective tool for decluttering. 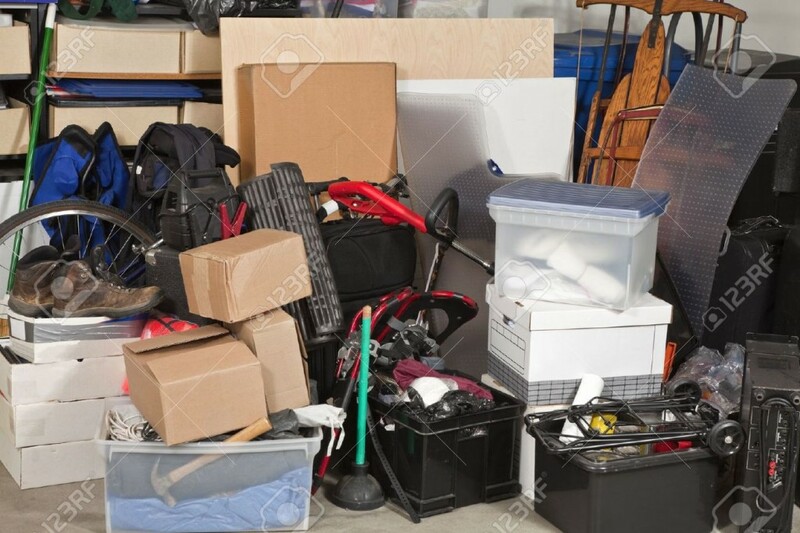 While not everyone qualifies to be documented on Hoarders, most of us have things that are unused and just taking up space. And while you might expect a big declutter project to begin in January (along with all the other New Year’s resolutions), two things motivated us to start a little early. First, we’ve entered that time of year when cold weather and shortened days move us inside where we’re forced to face our clutter on a daily basis. Ugh. Second, we’ve started decorating for the holidays, and what better time to start sorting than after we’ve pulled all those boxes down from the attic. Ugh, again, but with garland and glitter. So this is just the first of several posts about my family’s “Project Declutter.” We’ll start with Christmas–’tis the season, after all–and move on to other categories (books, videos, clothing) and even specific spaces (garage, closet, the black hole known as my office). One, clutter is not synonymous with junk. Many people equate the two, but that’s an oversimplification. If it were just junk, it would be easier to eliminate. But it includes both things we want and things we don’t. And it’s the result of years of accumulation, little or no sorting, editing and removal, and an unfortunate combination of too much stuff and too little space. Which is why it takes time to sort through and make decisions, and why it’s often postponed indefinitely. Two, the “get rid of” process is often the biggest obstacle. Many declutter writers have lots to say about the identification and organization steps, but gloss over the tough part: getting it gone. Which, again, is why we’ve created Swampum, and we’ll be using the site to pass things along to others (hopefully people close to us) who can really use them. Three, discarding is the last and least desirable solution. Waste is never a good thing–for both economists and environmentalists. So, as much as possible, we’ll avoid throwing things away. So, let the “adventure” begin … next stop: Christmas! This entry was posted in Declutter on December 11, 2014 by swampumadmin. In her recent Chicago Tribune column, We’re Entering the Season of Stuff, she points out one of the downsides of living in a society overly focused on consumerism. We have too much stuff. And as we head into the “get more stuff” season, we have to figure out how to make room. Now, there’s nothing wrong with stuff in and of itself. It’s just stuff. But we often forget that 1) we are more than the sum of our stuff and 2) stuff can’t make us happy. Usually, though, on the way to learning these two important realities, we accumulate too much stuff trying to prove them wrong. And then we purge. Donations to thrift stores are great–those organizations do a lot of good with the money they receive from selling all our unwanted stuff. But, for the most part, we only donate the stuff that we don’t want anymore and isn’t valuable enough to give to someone close to us. Here at Swampum™ we are building a site–more of a community, really–that we hope will help people have a healthier attitude toward all of their stuff. 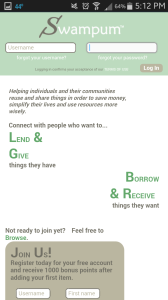 From giving away unwanted clothing to borrowing books and DVDs to lending garden or home improvement tools, we’ll all have less stuff to wade through if we accumulate less and share more. We hope you’ll join us! And remember … it’s just stuff. This entry was posted in Uncategorized on November 25, 2014 by swampumadmin. We’ve been working to make our site more mobile friendly, and our latest update moves us much closer to that goal. To save myself a few thousand words, here are some screenshots demonstrating the features on several different pages. First, on the home page, you’ll notice that the site adjusts to your mobile device (smart phone or tablet) with the login fields conveniently at the top. Next, if you scroll down to the bottom of the home page (before logging in), you’ll notice a more graphical introduction to the site (a first step in making the help pages more user friendly). After logging in, you’ll notice that navigation has been compressed into two rows in the mobile header. The first row includes icons for the sidebar menu, items, transactions and messages. The second row includes a plus-sign icon (for adding items and groups) and a search bar/magnifying glass (which allows searching for items, groups and users). The remainder of the feed page shows the most recent activity in your account–all formatted to be more readable on a mobile device. The items page shows the items most recently added to the site, including a filter button that makes it possible to narrow the search results. Finally, the menu button opens the sidebar menu, which includes many of the same functions available on the full browser site. We hope you enjoy using the site on your mobile device. As always, let us know what you think! This entry was posted in Uncategorized on November 8, 2014 by swampumadmin. Editing multiple items: Users have always had the ability to edit the details of a single inventory item. But if a user wanted to edit the same data field across multiple items, it required going into each item individually and making the change. Now it’s possible to edit across multiple items at the same time. 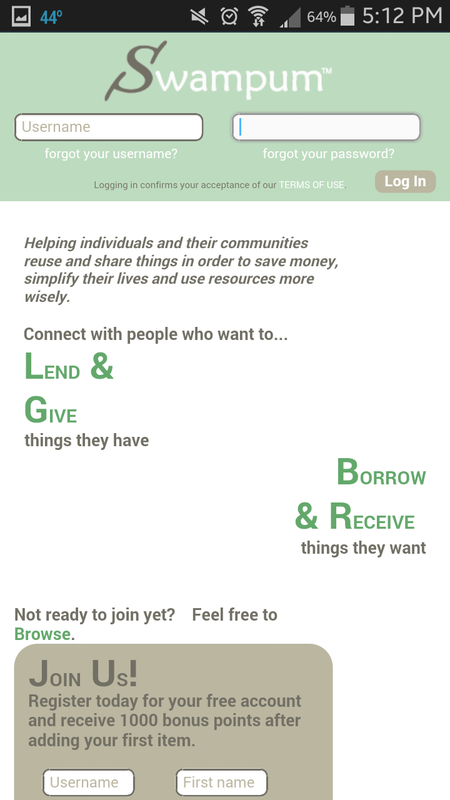 For example, if a user has listed a dozen books as Lend items but decides he no longer wants to keep them, he could change all of them to Give items in one step. Or, if another user has posted several Give items for points, but decides she just wants to get rid of them quickly, she change all of them to Free items by reducing their point values to zero–all in one step. Most item details are changeable with this function. It’s even possible to increase or decrease point values by a percentage amount and to change the shipping and availability settings for multiple items. How to do it? In your item inventory page, choose the spreadsheet view for your items (the third of the three view type icons at the upper right of your inventory listing). Use the sidebar filters to reduce your inventory list to the items you want to edit. Select which items you want to edit with the checkboxes at the left of each line (or choose everything on the page with the checkbox at the top of the column). 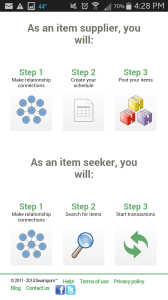 Then click the “Modify multiple items” button. You will then be taken to a page with the item fields that you can change with this multiple editing feature. Reorganized group pages: The group information and management pages have also been streamlined. 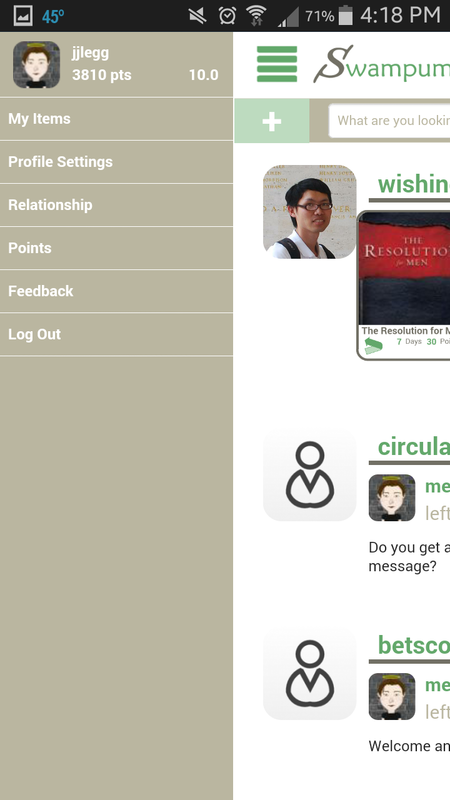 The Memberships page (the second tab on the Relationships page) shows a list of a user’s groups as well as a link to the “Create a new group” page. Clicking on the name of any group in the memberships list takes the user to that group’s detail page, which includes a secondary tab menu that leads to pages with more detailed information about the items, members and messages related to the group. Email preferences: It’s now possible to choose from three settings (immediately, daily and weekly) to control how frequently notifications are sent about activity in a user’s account. The page can be found by clicking the “setting” link on the user profile page. In the future we plan to give more control to the user in this area by making it possible to sent a different notification frequency for different activity types. We’ve also made several other smaller improvements, including more descriptive button titles, clearer filter menu titles and progress on a mobile version of the site. And there’s much more to come. Let us know what you think. We’re always interested in hearing from users, especially when it helps us make the site more usable! This entry was posted in Improvements on October 13, 2014 by swampumadmin. As we’ve come to realize, web site development is an odd combination of programming, project management and publishing. With the added twist that nothing is ever finished–there’s always a change here, a tweak there … and a big improvement in that corner over there you’d forgotten about completely. So it should come as no surprise that we’ve made a few changes in the past few weeks. Some of them from our own list of things to enhance or embellish; others driven by some very helpful feedback we’ve received from our first users. We hope you find that these changes improve the useability of the site. First, a new browse landing page replaces the previous browse page (which showed only the most recently added items). 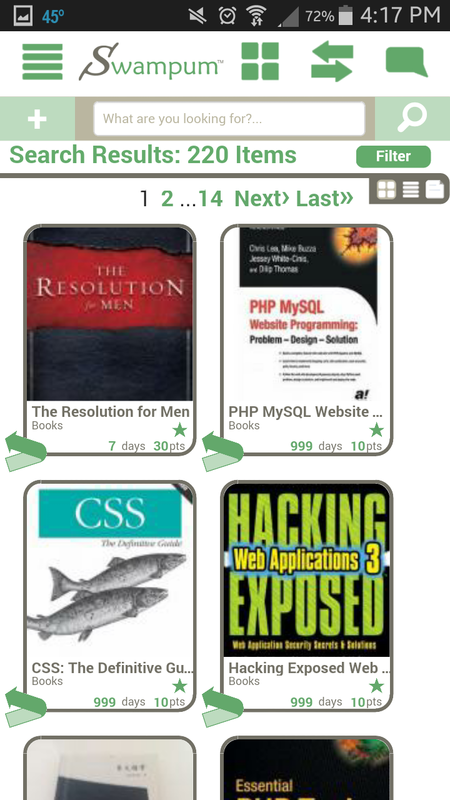 The new browse page–visible to users who are not logged into the site, but also reachable by logged-in users–shows a collection of thumbnail icons (e.g, Books, DVDs, Free Items, How it Works, etc.) that lead to filtered searches or help pages that visitors should find most helpful. A similar change has been made to the logged-in user’s home page. 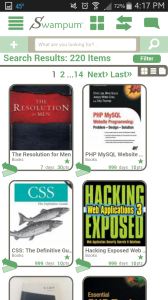 The size of the feed on the home page, which shows recent messages received in the user’s account, has been narrowed to allow for the placement of thumbnail icons similar to those on the new browse page mentioned above. (The “Browse Map” link at the top of these thumbnails will take you to the browse page described in the previous paragraph.) Since this page is only visible to users who are logged into their accounts, these thumbnails can be more personalized based on a user’s activity and account details. 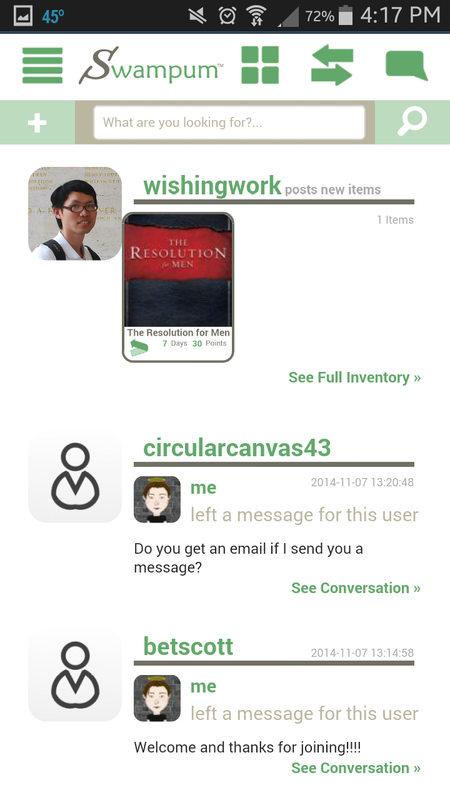 The user’s feed has been also enhanced to show not only account messages but also items added by friends and or group members listed in each user’s availability schedule. More flexible filters have been added, both to item search results pages and to each user’s “My items” page, and are visible in the left sidebar menu. The transactions pages have been updated with a new graphical representation of the series of steps necessary to complete a transaction. Two introductory help pages, “How It Works” and “What to Do First” have been added in a new Getting Started section of the help area. We hope you find these changes helpful. If you have any question, comments or suggestions, please send us a note using the “Contact Us” link in the footer of every page. This entry was posted in Improvements on July 28, 2014 by swampumadmin. It all started with a faucet wrench. Several years ago, in the middle of a kitchen renovation project, I needed a faucet wrench–a special tool for tightening the bolts that connect a sink to a countertop. One trip to the hardware store and $25 later, I had my wrench. A few weeks later I was catching up with a church friend and mentioned my project. He told me he had a faucet wrench in his garage that he’d also bought for the one time he’d replaced his sink, and that I could have borrowed it–if only we’d known. To this day, both faucet wrenches sit unused in our garages. Our homes and garages are full of things like this that are rarely used but too valuable to discard: tools, furniture, books, CDs, DVDs, video games. I looked online for someplace that would solve the problem of clearing out or making use of all this stuff. Things that I no longer want but would prefer to lend, give away or sell to people I know and who would put them to good use. No site does what I want. So my partners and I built a website–a place where people could find things they want or share things with friends and others. And control who among their family, friends and other relationships can see their posts and when. Swampum™ is that site: a place where you can find things you want and get rid of things you don’t, all while sharing with those closest to you or others in groups you’ve joined. This entry was posted in Uncategorized on June 17, 2014 by swampumadmin.